Jaapna Dhillon is UC Merced’s first postdoctoral researcher to receive a Pathway to Independence Award from the National Institutes of Health. Jaapna Dhillon had no idea that studying how almonds affect health would win her a huge advantage in securing a tenure-track position. But Dhillon just became UC Merced’s first postdoctoral researcher to receive a Pathway to Independence Award from the National Institutes of Health (NIH). Dhillon, who earned her Ph.D. in Nutrition Science at Purdue University, is a researcher in School of Natural Sciences Professor Rudy Ortiz’s lab, where she and others have been looking at the effects of almond consumption on health and pre-ingestive controls of nutrition. Dhillon credits the campus’s diverse ethnic make-up and mentorship as key components of her success. Before beginning her next phase of nutrition research, postdoctoral fellow Jaapna Dhillon learns how almonds are harvested and processed. Dhillon will receive one to two years of funding at UC Merced — the K99 portion — followed by up to three years of R00 funding once she lands a tenure-track faculty position. Her route to nutrition science and health disparities research didn’t happen instantly. After receiving a bachelor’s degree in bioinformatics in India, Dhillon took a job at a software company for two years, still unclear about her ultimate career path. Then she got interested in fitness and nutrition and became a certified fitness trainer. After earning a master’s of science in Nutrition at Syracuse University, she focused on clinical nutrition at Purdue. Her dissertation looked into the benefits of almond consumption on human health, setting her up for the research she is doing now. In 2016, she met Ortiz through her Ph.D. advisor and the two discussed the prospects of a pending grant with the Almond Board of California studying the effects of almonds on substrate metabolism and gut microbiome. “These are things that are relatively new to the nutrition field, so I was really excited about working in that area,” said Dhillon, who joined Ortiz’s lab in fall 2016. It was the demographics of the student population combined with the research support I received at UC Merced that got me this award. In spring 2017, Dhillon led an eight-week almond intervention with undergraduate participants. The first manuscript from the study was recently published in the journal Nutrients, showing that snacking on almonds can improve key metabolic indicators for breakfast-skipping college students. Dhillon’s K99 funding will allow her to perform nutritional metabolomics — the study of chemical processes involving metabolites — and develop a model to predict the effects of almond consumption on metabolic factors that she can test in a small subset of first-year students. “I focused my proposal on minority populations because they are at a higher risk for metabolic disorders,” Dhillon said. She will continue to analyze the data and get more training to investigate whether minority individuals respond better to a functional food diet that includes fruits, nuts and vegetables. 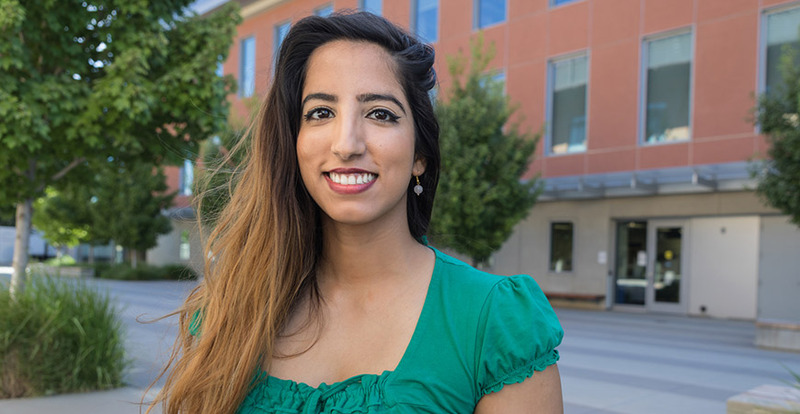 Dhillon will have the support of her mentoring team: UC Merced Applied Mathematics Professor Suzanne Sindi; UC Merced Nutrition Specialist in Cooperative Extension Karina Diaz Rios; Oliver Fiehn, director of the West Coast Metabolomics Center at UC Davis; and Ortiz.